Pharr Mayor Ambrosio Hernandez delivers his state of the city address Thursday, January 18, 2018, in Pharr. 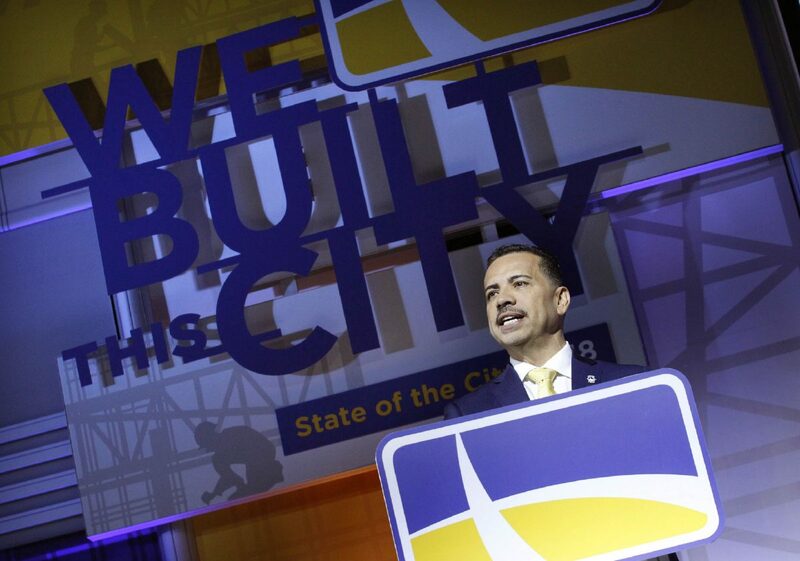 PHARR — Two years after first anonymously evaluating their leadership, city employees again reviewed officials and concluded that they’re generally satisfied with their bosses. Perhaps most notably, there were no concerns this time around with Mayor Ambrosio Hernandez’s wearing of scrubs, according to the anonymous study conducted by Michael Uhrbrock, economic research director with the University of Texas Rio Grande Valley. The fifth largest concern for city employees in the 2016 study was that Hernandez often wears scrubs, which once inspired a joke from U.S. Sen. Ted Cruz, R-TX, when he visited the Pharr-Reynosa International Bridge in August. While Hernandez did not change his public wardrobe since the last survey, city employees gave Hernandez, City Manager Juan Guerra and members of the city commission higher marks than in 2016. At an employee training event at the Pharr Event Center in February, Uhrbrock distributed the paper survey to employees, and 484 surveys were returned. On a scale of 1-5, from poor to excellent, Hernandez received a 3.82 overall rating, which Uhrbrock said was between average and above average. City employees were most satisfied with Hernandez’s clear policies (3.98 rating) and least satisfied with his accessibility and feedback (3.60 rating). Guerra received a 3.63 overall rating. Employees were most satisfied with Guerra’s responsibility, accountability, strategic objectives and vision (3.75) and were not as satisfied with his motivating (3.52). Commissioners earned a 3.65 overall rating. Employees pointed most positively to commissioners’ economic development understanding (3.78 rating) and most negatively to their level of supervision (3.41 rating). The top comments from employees revolved around praise or satisfaction of the city commission, seeking more visibility or contact, hiring decisions, listening to employees, and pay and bonuses.